The city of Los Angeles offers tons of attractions, LA is the largest city in the US and the most exciting tourist destination, this amazing full day tour of LA will show you the most popular spots of the city and much more, see LA Live, Staples Center, the Historical Street of Broadway, the Disney Concert Hall, Olvera St and el Pueblo de Los Angeles, site of the city foundation in 1781, later we will visit Hollywood including, the “Walk of Fame”, the Dolby Theater (formerly known as Kodak), as well as the world famous Rodeo Drive in Beverly Hills, finish the day with a visit to the Santa Monica's Pier and Venice Beach. Your tour starts with complimentary pickup from your hotel in Los Angeles and Hollywood. You can even request pickup from the Los Angeles International airport (LAX). Your guide will pick you up in full sized Mercedes Benz Sprinter. On this tour your will pass by several landmarks as you can see in list below. During the tour, you will have the opportunity to stop for lunch at the Farmers Market hosting tourist since 1934. Olvera Street, birth place of the city in 1781, also in the area are Union Station and China Town. 15 min stop. Hollywood Walk of Fame, see the famous stars on the side walk along Hollywood Blvd. 30 min stop. Chinese Theater, where the hand prints of the movie stars were imprinted on the cement at the forecourt of this theater. Hollywood Sign from Griffith Observatory. 20 min stop. Farmers Market for lunch, this is a great food market since 1934 delighting locals & tourist year round. 1 hour stop. The famous and glamorous Rodeo Drive, with the most exclusive designer stores, often visited by celebrities & movie stars. 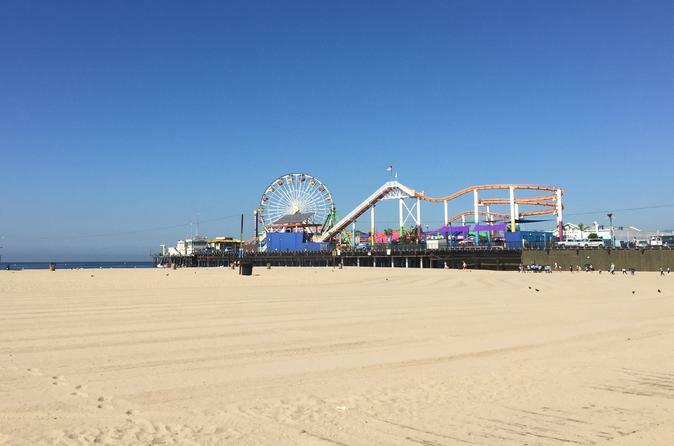 Santa Monica’s Pier, LA’s favorite beach. 30 min stop. Venice Beach with the famous boardwalk. 20 min stop.